There are many things to love about the Cayman Islands. Ristorante Pappagallo. More than just a place to eat, Ristorante Pappagallo is a complete experience. Situated in a bird sanctuary perched on the edge of a lagoon, this provides a truly unique dining environment. Get a close-up look at a wide range of exotic birds in their natural habitat. A great choice for a romantic sunset dinner or a family meal. Be sure to take plenty of pictures, as the scenery makes for the perfect photo background. Cracked Conch. A perfect choice for authentic local fare, especially fresh seafood. Feast on traditional local meals created by the Cayman Islands Chef of the Year, Gilbert Cavallaro. For lunch, dinner or dessert, you will find plenty of options you cannot resist. You can even just enjoy a drink at their distinctive bubble bar. Host a large group or private event in their Soto Room. 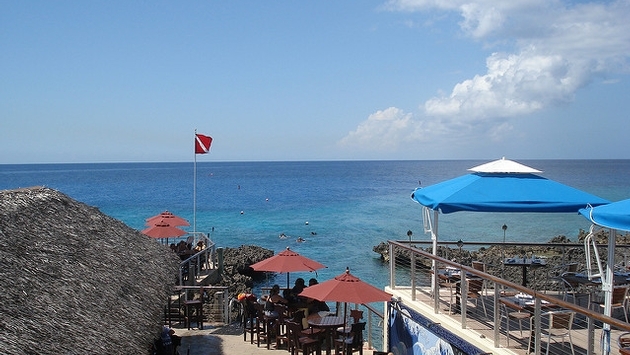 Or opt for their sister location, Macabuca, known as Grand Cayman’s premier ocean front tiki bar. The Bistro. Bringing the charm of a neighborhood French bistro—combined with the delectable tastes you would find there—The Bistro is the perfect place to stop for a relaxing lunch, or to enjoy a romantic date night at dinner. The warm inviting atmosphere also makes this a great location to hang out with friends for casual drinks and conversation. Of course, you will want to seize the opportunity to try out some of the excellent French cuisine, such as Foie Gras Crème Brûlée, Dorade Royale, Canard à l’Orange or Poisson du Jour. Grand Cayman Marriott Beach Resort. While not technically a restaurant itself, this resort is home to several of the most popular dining locations in the area. Veranda is their oceanfront restaurant where you can take in amazing views of Seven Mile Beach while feasting on their signature lobster fete or any of the other culinary delights on the menu. The property is also known for its Tapas Night, as well as its Mad Tea Party. Whichever you choose, it is sure to be among the highlights of your visit! YARA Steakhouse. If you love being a trendsetter and always want to be the first to know about the hottest new places, keep an eye out for YARA, which will be opening soon. A steakhouse unlike any you’ve seen before, it offers terrific food, an extensive wine list, a live DJ and an energetic vibe. Watch for updates so you can be among the first lucky customers to check out this hotspot. It will quickly become the place to be!